Spend a week on the shores of Lake Como, just north of Milan and arguably the most beautiful lake in northern Italy. Cruise the waters of the lake, relax in Bellagio and cross into Switzerland to visit little Lugano and ride the Bernina Express to exclusive, sophisticated St Moritz. Flights also available from other UK airports – Birmingham, Bournemouth, Cornwall Newquay, Durham Tees Valley, Humberside, London Gatwick, London Luton, London Southend, London Stansted, Manchster & Norwich – click here for more information on available dates and prices. Today you’ll fly to Milan and then board our coach for the transfer to Lake Como and your chosen hotel. Soak up the splendour of Como’s spectacular surroundings as we take the ferry across to Bellagio, on the lake’s southern shore. Often listed as the most beautiful town in Italy, Bellagio’s villas, gardens and lakefront promenade nestle in the wooded hills overlooking the lake. After a short walking tour you’ll be free to wander, stop for coffee, gelato or something a little stronger, and then take the ferry back across the lake in your own time. Take a second boat trip on Lake Como’s still waters, today. Relax as the wooden shoreline slips by, revealing the elegant villas and grand hotels that shelter along the water’s edge, on a day that also includes a visit to the pretty gardens of Villa del Balbianello. The cultural capital of Northern Italy, Milan, is the destination for today’s optional excursion. A world famous centre for the fashion industry, Milan is also a treasure trove of culture, art and architectural splendour. The Sforzesco Castle, the famous shopping Galleria, La Scala – one of the world’s greatest opera houses – and the great cathedral, Il Duomo are among its unforgettable sights. A fantastic rail journey awaits, this morning, as you board the Bernina Express in Tirano. 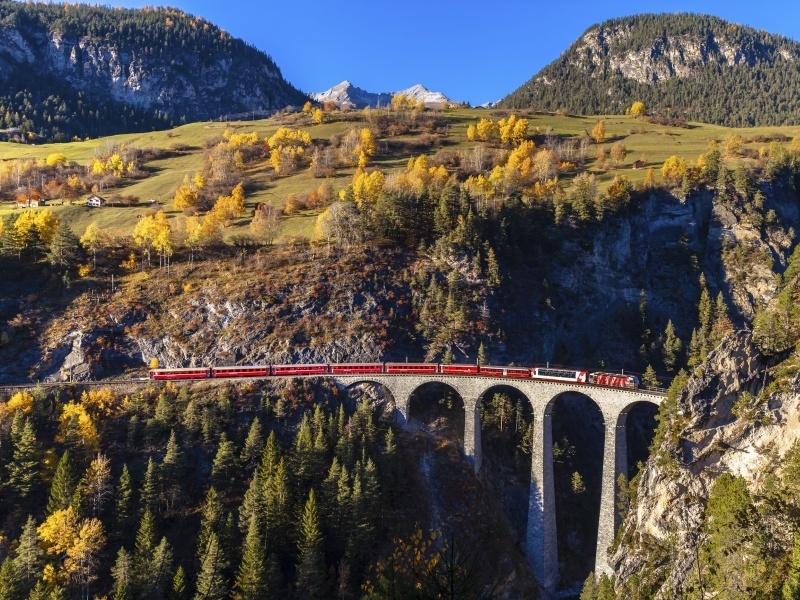 Cross the Italian border and follow the spiralling viaduct at Brusio, then glide through the alpine paradise of Switzerland’s Italian-speaking southeast corner, across the 2253 metre-high Bernina Pass to St Moritz. Here you’ll have the chance to explore before returning to your hotel by coach. Spend today relaxing in and around your hotel, or join our optional excursion and cross into Switzerland once more as we make our way to Lugano. Discover the stylish resort and its namesake lake on a short sightseeing tour, then explore, and perhaps take a ride to the summit of Monte Bre to enjoy the immense views across the lake and Alps. Our final optional excursion explores the twin city of Bergamo. Here the 16th-century walls of Alta (the upper city) shelter the grand Palazzo della Ragione, churches and colonnaded library that surround Piazza Vecchia, and overlook the Neoclassical buildings of Bassa (the lower city). Don’t miss the chance to enjoy a meal – or at least a snack – here, in a city famed for its food and fondly championed by Antonio Carluccio. Say goodbye to Como and your hotel, today, as our coach arrives to carry you back to the airport for your flight home.